RemoteSwitch is a GUI utility that automate the execution of custom command at the startup (OnStart commands) and at closing stage (OnExit commands) of the application. 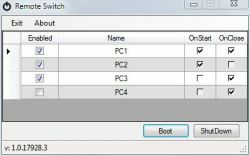 By adding RemoteSwitch at you workstation startup you can easly configure custom scripts to bootup remote PC, and then shutting it down with your workstation. RemoteSwitch runs minized to try icon and remote commands can be even executed even by click requests, and eventually disabled. Custom OnStart and OnExit scripts can be written using external programs, and then added to the RemoteSwitch.xml configuration file.